1 kilogram (1 litre) of typical commercial Nitrogen liquid contains 10.5 grams of soluble nitrogen from the [Urea + Nitrate salts] and 20 grams of soluble potassium. This will on average set you back £28 or so. That same £28 will buy you either 25,000 grams of Urea powder or 5000 grams of Potassium Nitrate powder. This means you could “roll your own” - about 200 liters of Nitrogen mixture and still have enough Urea powder left over to last the next 5 years. Many are hesitant to use the dry powders because the arcane chemical names and formulas are intimidating, evoking traumatic images of failed high school chemistry examinations and the dire consequences of those failures. The mathematics of dosing often seem vague. More often than not, the thought of chucking great quantities of “dangerous” reagents in the tank is an anathema. 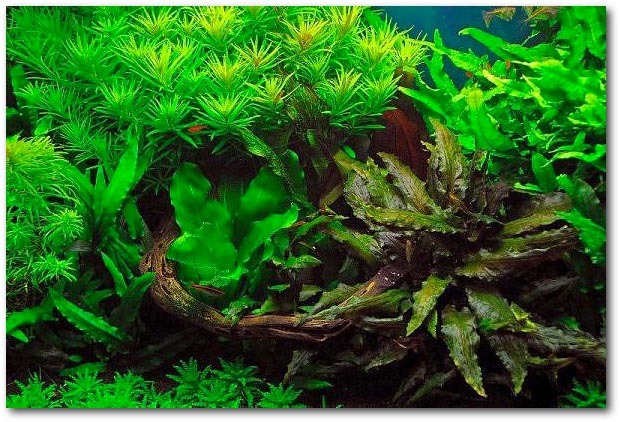 In this article I’ll attempt to allay these fears and to show how, of all things associated with a planted tank, dosing dry powders is actually the easiest thing you can possibly do with the highest return on the investment of your time and money. The first step in alleviating these fears is to change our mind set as to what these powders are. Instead of perceiving them as toxic chemicals we need to view these powders as food. They are after all, salts and are formed in exactly the same way as table salt. You sprinkle these salts over your aquarium water as you would salt over your vegetables. Even the most sensitive species are completely unaffected by addition of the dry salts and will breed quiet happily assuming breeding parameters are satisfactory. EI stands for Estimative Index. This is not just some arbitrary marketing phrase. An index is a reference point from which we can measure differences or deviations. We determine the amount of food required for a certain collection of plants under a certain set of conditions (maximum growth conditions). This amount required for max growth is the Index and we estimate what amount will then be required as conditions vary. The focus of EI is to ensure that the plants never lack any of their required nutrients. The most common expression used in the EI lexicon is the term “Unlimited”. 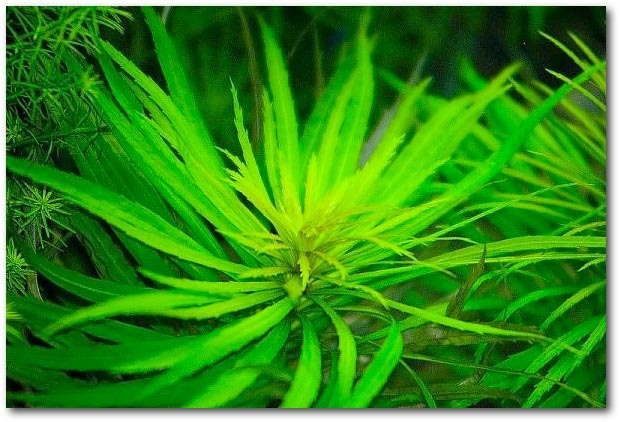 This means that there is never a situation in which the plant requires a certain amount of a nutrient when that amount is not present in the tank. Another common expression is “Uptake”. Like a sieve, plants draw water across their membranes and filter out whatever nutrients are in that water. They therefore remove nutrients from the water column and from the substrate so that if the nutrients are not replaced, the nutrient content in the water will fall to zero. This removal from the water is the uptake. The amount of nutrient removed over a certain time period is the “Uptake Rate”. When we add a certain weight of nutrient powder to the water, the powder dissolves creating a certain “Concentration” in the tank. 1 milligram of a powder dissolved in 1 liter of water produces a concentration of 1 “Part per Million” or 1 ppm. It’s much easier to talk about concentration rather than number of milligrams in a tank because that way we can compare two tanks directly without regard to their size. 1 ppm in a 20 Gallon tank is exactly the same concentration as 1 ppm in a 1000 Gallon tank, however, the 1000 Gallon tank will have 50 times as much weight of powder dissolved in it (it also has 50 times the amount of water in it). 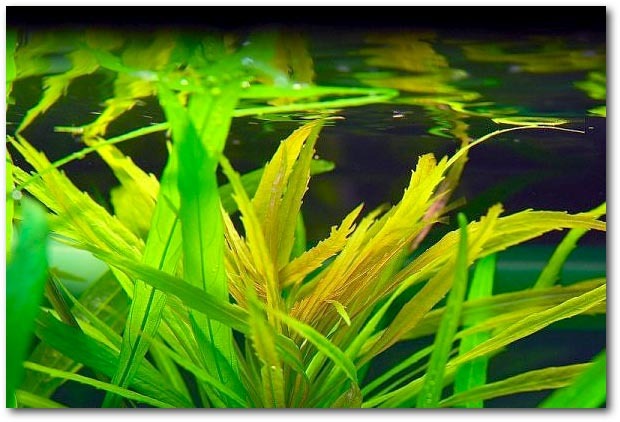 Since the plant has no idea whether it is in a small tank or a big tank it can only sense the concentration of a powder in the water as it passes over the membranes, not the total weight dissolved in the tank. If you measure the concentration of a powder at Noon on Monday to be 10ppm and then measure again on Tuesday Noon a value of 8ppm then the uptake rate would be expressed as “2ppm per day”. This is the fundamental arithmetic of any dosing scheme and it is very important to become comfortable with the concepts of concentration levels and uptake rates. The concentration level should be thought of in the same way as the sweetness of a drink for example. 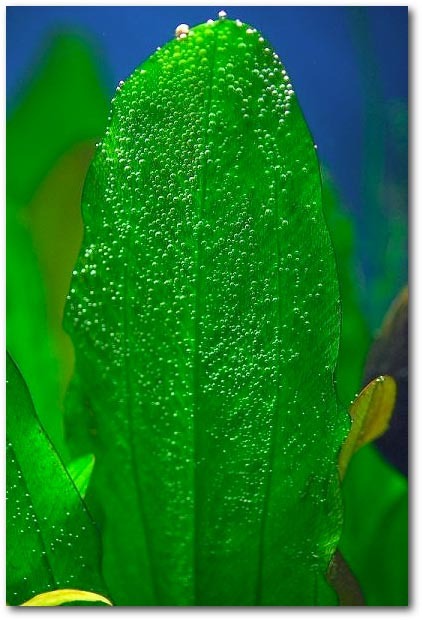 The uptake rate of a nutrient by a plant is determined primarily by the amount of light falling on the leaf surface. More light creates a “Demand” for more nutrients. The plant has absolutely no choice in this. Plants make their own food on an assembly line. On that assembly line all the components for that food must be collected, assembled and transported to storage facilities. High light quickens the pace of the assembly line and the plant must then quicken it’s pace of nutrient collection. When there is a nutrient shortage the assembly line the plants first response is to use whatever food it has stored. If no nutrients are made available and if the stored food runs out growth, declines and the plant is endangered. Fast growing stem plants can only be fast growing because of extreme uptake rates satisfied by nutrient availability. We can see therefore that if a 20 Gallon tank is lit by 20 watts of light the uptake is slow, let’s say 1 ppm per day as an example. All I need to do is to ensure that the tank always has at least 1 ppm to supply the needs of the plants in the tank. If I added a second 20 watt bulb the uptake demand would increase to perhaps 2 ppm per day. If I continued to only supply 1 ppm per day the assembly line would soon grind to a halt. I need to supply at least 2 ppm per day. More light always creates a higher nutrient/CO2 uptake demand. Higher uptake fuels more vigorous growth rates. 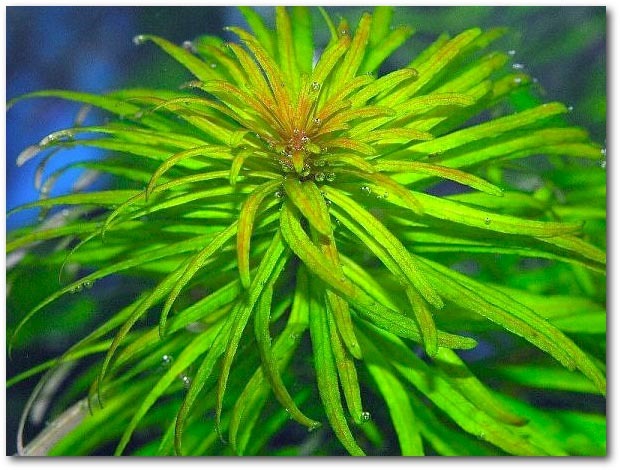 The mighty Pogostemon stelleta (Eustralis) has an insatiable appetite for nutrients/CO2. After rocketing to the surface 15 inches away from it’s planted position within a month the crown was topped and replanted. As shown on the right, this crown slowed it’s vertical growth in favour of expand outward. It measures over 5 inches across the crown diameter. As a reference, Didiplis diandra branches can be seen just to the left on the second photo. Extreme growth rates like this don’t suit everyone but they are incredible to behold. These numbers tell us that if we can provide the weekly ppm listed next to each nutrient then we will be providing the maximum nutrients that the plants can eat, even if that tank (any size) is illuminated by 5-6 WPG. Few people have a 5 wpg tank and as we saw, a lower lighting level creates a lower uptake demand so if we had a tank lit by only 2 wpg it would consume less than the numbers above. The problem is that we are not sure how much less because the tests were not done for every possible lighting level. The good news is that it does not matter. If the tank has lower lighting than 5 wpg then it simply means that there is a greater margin of error and less chance of consuming more that we are dosing. After a bit of experience and careful monitoring we will be able to determine, if we wish, how much we can lower the dosing to match the lower lighting. This is where the “Estimative” part comes in. You can see that if the tank were lit with 5wpg and if the uptake rate were maximum (3ppm) you would just about run out of nutrients the morning of the water change. If you skipped a day of dosing you would really be playing with fire. Since most of us don’t use this much light there is a surplus by water change day. Some people really fret about this surplus, or “Nutrient Build-up”. Really though it just doesn’t matter. If anything, it gives you an extra cushion if you miss a day or two like being out of town for a long weekend for example. 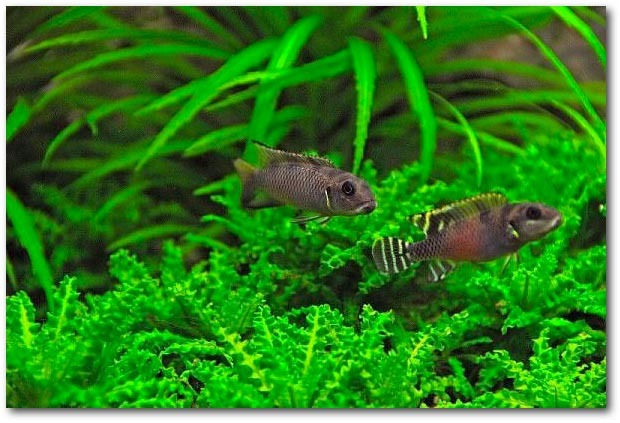 Many people associate the water change with control of the nutrient build-up, however, water changes in a high light tank are necessary because of the by-products of fish and plant metabolism. Dead or decaying leaves, protein and enzyme discharge, faeces, urine and detritus all decompose into ammonia if left in the tank. The purpose of the water changes, is to remove as much of this organic waste as possible. The example given above is for a 20 US Gallon tank but the teaspoon dosages can be scaled directly. If your tank is half as large then you would use half much powder. If a tank were for example 57 gallons you would simply multiply the teaspoon count by 57/20 or 3. There is no need to be exact. There is no need to calculate how much actual water you have (20 gallon tank but only 15 gallons of water). That’s why this is “Estimative”. As long as you have more than the max possible uptake the plants will not starve. Many of the calculated teaspoon values, especially for small tanks, are ridiculously small, such as 1/32 of a teaspoon for example. This is clearly a ridiculous portion to attempt to measure. The way around this is to make up either a 1 month’s worth water solution or a dry mixture and apportion the doses. So-called “root feeders” benefit greatly from water column dosing and in fact are among the most voracious of water column feeders. Growth rates of Echinodorus can be brutal and they can easily swallow the tank, both above and below the substrate level. Heavy pruning and occasional uprooting is necessary to keep this species in check when dosing EI. This makes life easier because you need only dose 50ml of this NPK solution 3 times per week. Always separate the CSM+B from the NPK because it has a tendency to react with the phosphate. 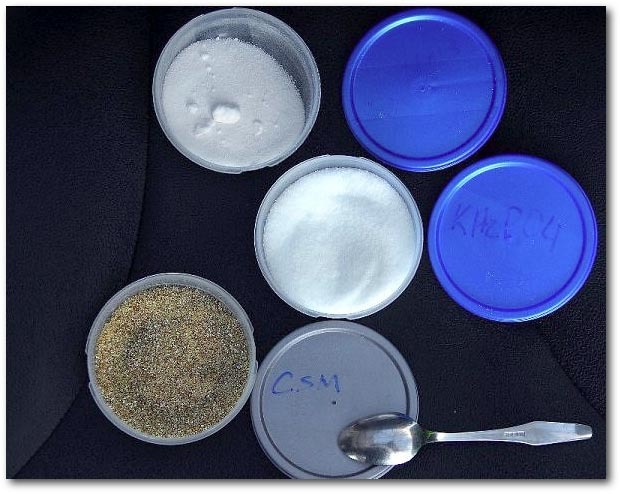 You can dose the CSM+B as a powder or if it more convenient add 8 * 1/16 tsp => ½ teaspoon to 200 ml of water and dose 25 ml two times per week. Naturally, the mixture scales in the same way. If the tank is twice as large than you would add twice as much powder to you 600ml of water and so on. I have also been asked “What is a teaspoon?” “Do I use a heaping teaspoon or a level teaspoon?” The answer: It just doesn’t matter. Just be consistent so that if you need to make adjustments to the dosing (either up or down) you will be able to do it logically. 1. Hobby grade test kits, for our purposes are inaccurate. That would not be so bad in and of itself but they are also inconsistently inaccurate. This means that one day they can be merely marginally wrong and the next day the same kit can be grossly inaccurate. A simple change in humidity can throw off a kit’s response. 2. Test kits are expensive. The more accurate the kit the more expensive. Hach produces some of the more reputable test kits but they may be ten times as expensive as the basic kit. 3. The test kit, even the more accurate ones may not tell you anything that you don’t already know if you are following the dosing scheme. If you dose 7ppm nitrate this morning and your tank uses a maximum of 3ppm, then by the end of the day you know that you have at least 4ppm remaining. In the EI dosing philosophy you only care about having at least some target value in the tank. The objective is to avoid falling below the uptake rate limit. If you have more than this limit then great, but because you know how much you dosed you then know absolutely that you have at least that much. 4. The type of algae that develops in our tanks normally occur for specific reasons and due to specific nutrient deficiencies. 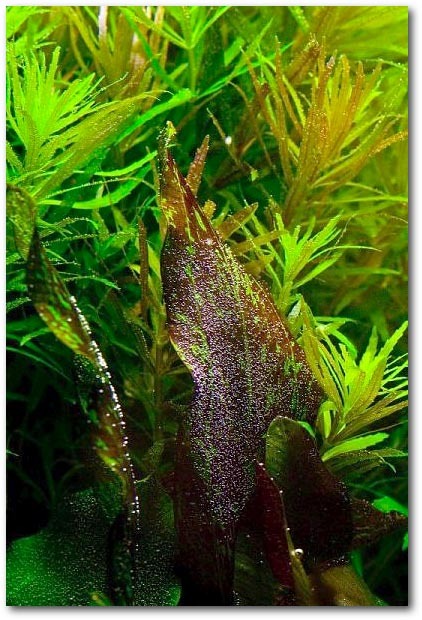 The appearance of a certain type of algae therefore tells you what you what nutrient requires more dosing. EI therefore does not require testing because a known amount of nutrients are added to the tank thereby eliminating any ambiguity. Of course if you enjoy testing then by all means test, but just be aware of the pitfalls. Won’t all these nutrients cause algae? These factors all have one thing in common - they all result in ammonia being jettisoned into the water column. In items 1. and 2. ammonia is jettisoned by the plants themselves as their cellular structure degrades due to starvation, thereby releasing not only ammonia but nutrients and organic matter. 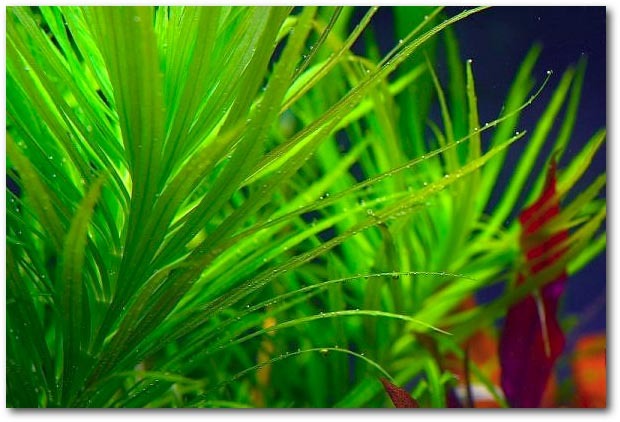 This is why various types algae will be seen attacking the plant. The same degradation occurs when insufficient nutrients are dosed. In items 3. and 4. Ammonia is produced by the decay of these organic products. In item 5. Ammonia is jettisoned due to the simple fact that within the soil or substrate there are billions of bacteria which convert various forms of nitrogen into ammonia, while other types of bacteria convert the ammonia into nitrite, while yet others convert the nitrite into nitrate. The substrate is a world unto it’s own which contributes to the ecology of the tank. Disturbance of the substrate, such as replanting releases all of these products into the water column. Ammonia in the presence of light causes algal blooms. 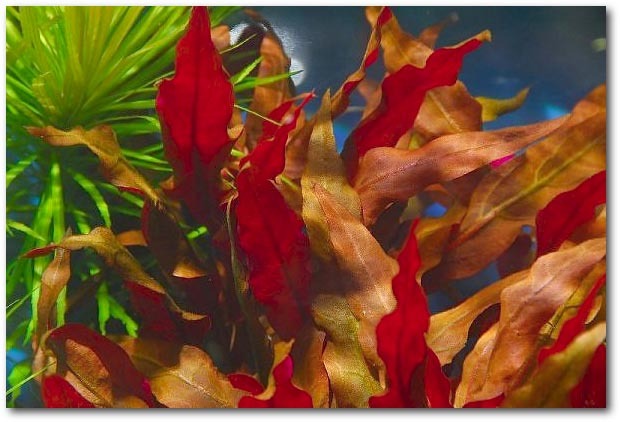 An immediate water change should always accompany any significant substrate disturbance. In all these cases the concentration level of ammonia that can cause the algal bloom is much lower than can be measured with an ammonia test kit. If we are to be successful with EI (or any dosing scheme for that matter) we must let go of the age old false principles which tell us that algae is caused by nutrients. On the contrary, it can be seen that algae outbreaks are a result of not having enough nutrients in the water column in conjunction with the causal factors list above. On the left, Ludwigia var Cuba is exotic but unforgiving. It will melt into oblivion if dosing and/or CO2 are sub-par. 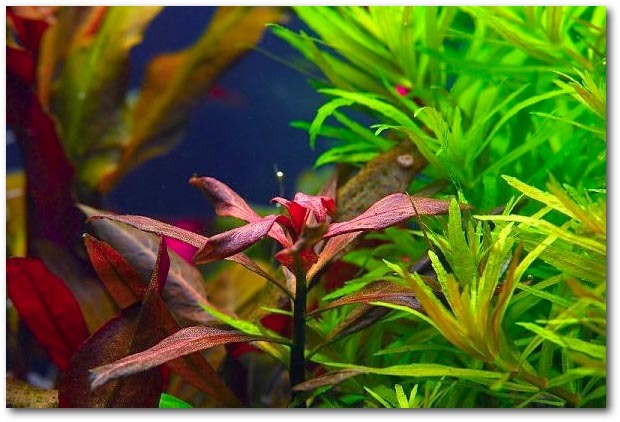 On the right, Ludwigia glanduosa wears a sign around it’s neck which reads “No Bozos”. Both species benefit greatly from EI dosing + CO2 injection. Full Metal Jacket. 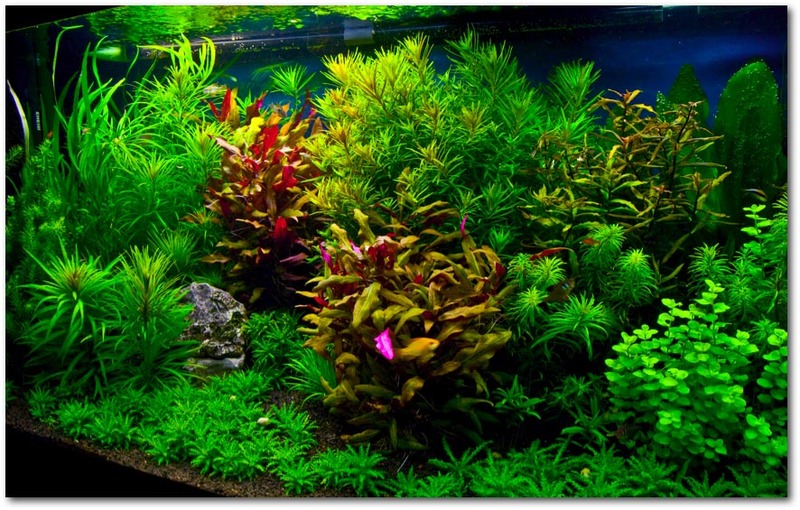 A high light tank maintained with strict adherence to the principles discussed above, injected with high, stable levels of CO2 and dosed according to the EI regimen creates a plant friendly environment impervious to algal attacks and will reward the hobbyist with stunning colors and outworldly levels of growth.